The Neshoba County Fair has its roots in the agricultural fairs and the church camp meetings popular in the nineteenth century. The Lake Patron's Union in Scott County was a regional fair held on the former site of a Methodist camp meeting and served as a model for Neshoba Countians wanting to establish a fair of their own. The first fair was called the Coldwater Fair and was held in 1889. 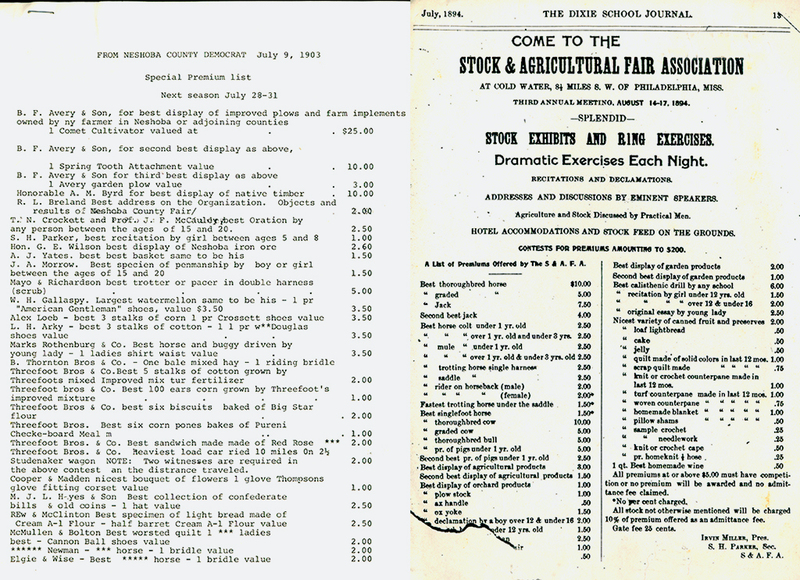 Two years later in 1891 the fair was organized as a private corporation called the Neshoba County Stock and Agricultural Fair Association and was moved to its present site. Admission was charged for the first time in order to operate the fair. The Neshoba County Fair remains a self-supporting non-profit organization today with operating funds derived mainly from admissions and concessions. Families coming to the Fair began camping on the grounds for the duration of the fair. In 1894 a pavilion was constructed and a hotel was built to accommodate visitors. Cabins began to replace wagons and tents and in 1898 the oaks were planted that shade Founder's Square today. The first cabins were simple one story structures with some being log cabins. In 1896 Governor McLaurin spoke at the Fair which began the tradition of the Neshoba County Fair as a political forum for local, state, and national politicians. Ronald Reagan, Jack Kemp and John Glenn are among the national figures who have visited the Fair during their campaigns. Improvements and additions were made to the grounds through the years. The race track was built it 1914 and the Fairgrounds received electricity in 1939. The Fair was not held during World War II, but was reopened in 1946. More cabins were built establishing distinct neighborhoods beyond the Square. The Fair was expanded to a seven day schedule and entertainment began to come from nationally known stars. The Neshoba County Fair has grown from a two-day meeting of local farmers and their families to an eight day Giant House Party in over 600 cabins and over 200 RV campers. The traditions of the Fair continue today. Families still gather for reunions and friends, old and new, visit every summer as they have since 1889.